Reeder is the best RSS client for macOS users. It syncs with lots of third-party services, looks good, and makes it easy to share content with others. RSS? Didn’t Google kill that off? The closure of Google Reader had many predicting the death of RSS, but in its wake, numerous services have sprung up, and there’s been a resurgence in RSS applications for both iOS and macOS. Unread — our favorite app for reading RSS feeds on the iPad — doesn’t have a desktop version, but that doesn’t mean the genre is dead. 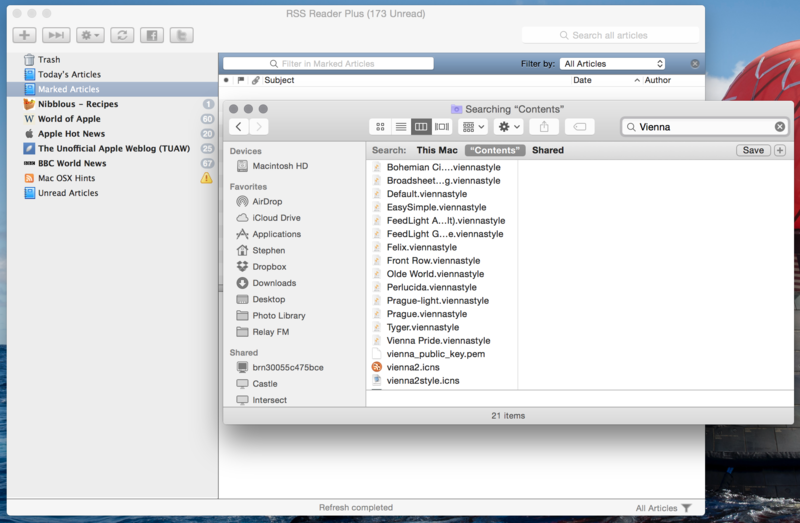 Quite the opposite in fact; searching “RSS” in the Mac App Store yields well over a dozen applications for sale. 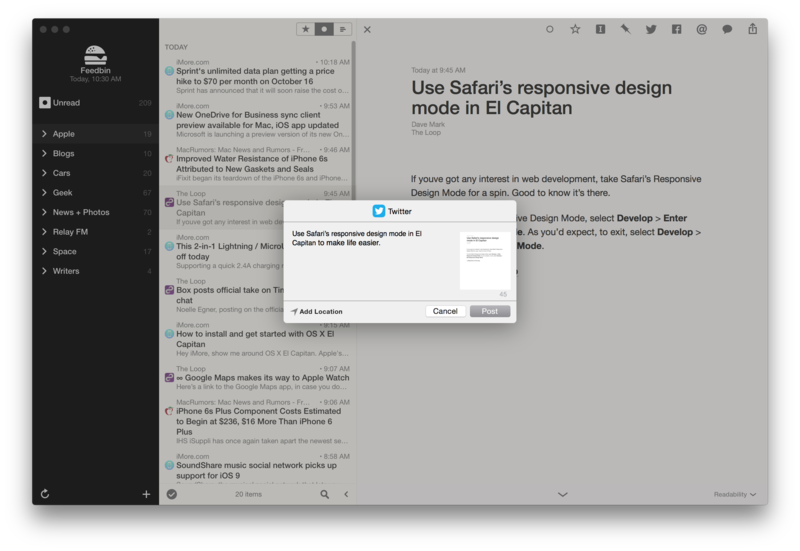 When looking at RSS clients for the Mac, integration is the name of the game. Any real contender should be able to pull feeds from any of the popular online services such as Feedly, Feed Wrangler, Feedbin, NewsBlur and more. In testing apps for this review, I set up accounts with Feedly, Feedbin, and Feed Wrangler with the same set of feeds subscribed to in each. For apps that don’t sync with RSS services, I had a test .OPML file with the same feeds in the same folders. Getting data out is just as important, however. A good RSS app should be able to save content to read-it-later services and share links on social networks as well as built-in macOS apps like Mail, Messages, and more. Lastly, and perhaps most important, a good RSS client should be easy to use and present users with a clean, efficient reading environment. 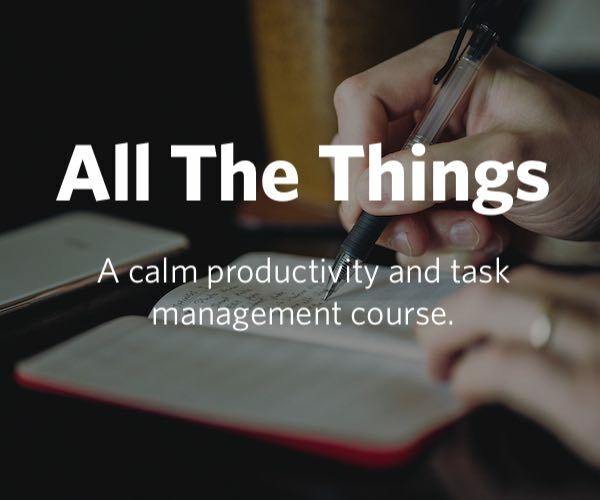 When it comes to dealing with lots of text, good UI and UX decisions are critical. The best RSS client for macOS is Reeder 3. Whilst Reeder for iOS and Reeder for Mac are the same app as far as the main concept goes (quickly fetch unread items for Google Reader, skim through them easily, provide features to do anything you want with RSS feeds), Reeder on macOS is obviously more “powerful” when you take in consideration the keyboard support, the subscription management, or the simple fact that links can be opened in the background in your desktop browser. For as much as people have criticized Reeder for Mac for being the start of an evil trend that will see iOS apps coming to the desktop (good luck with that), the undeniable truth is that Reeder is a Mac app, with all the evident advantages and limitations that come with it. 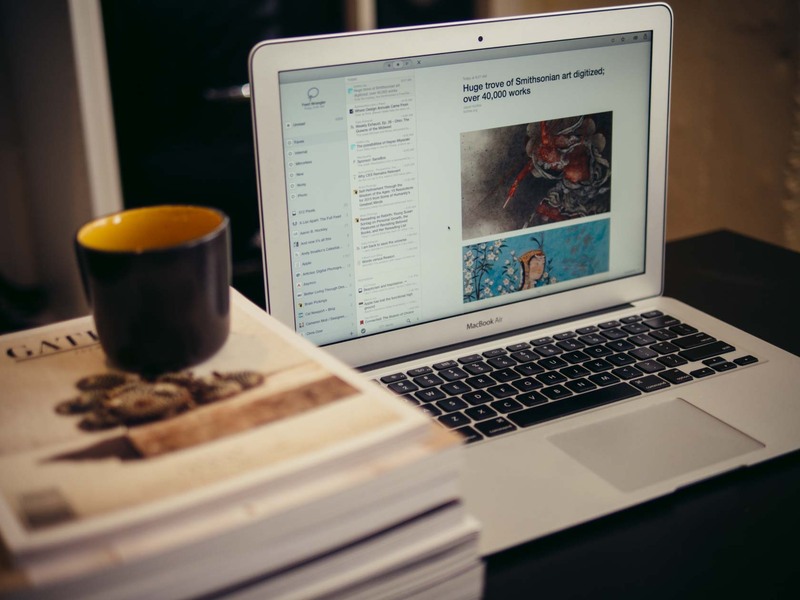 While the app we have today has seen a lot of improvements and changes in the years since launch, the fundamental experience of using Reeder has remained: it’s a fast and fluid way to blast through RSS feeds on the Mac. 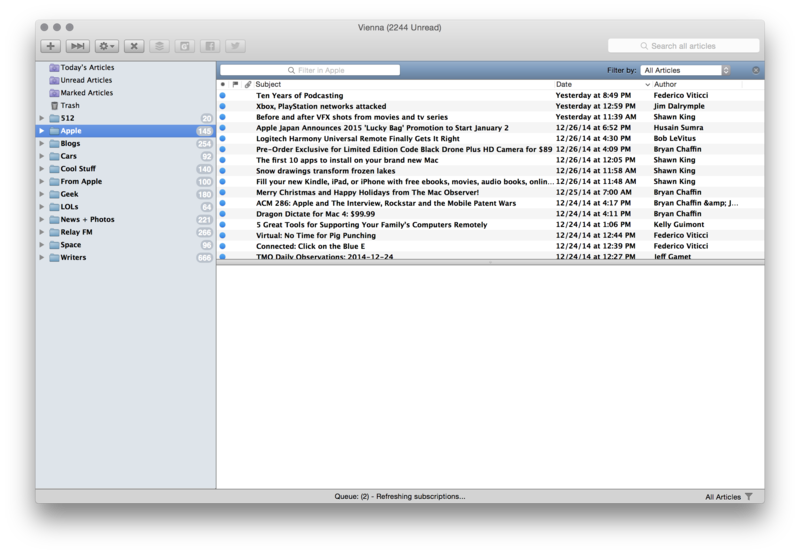 Reeder syncs smoothly with all three of my test accounts: Feedly, Feedbin, and Feed Wrangler. Unlike some apps that struggle with Feed Wrangler’s filters-that-are-only-kind-of-folders approach, Reeder knew what to do, presenting items organized by folder like the other accounts. When coupled with one of these services, Reeder will pull in unread items based on their state with the service. Mark something read on the web, and Reeder won’t pull it as unread. 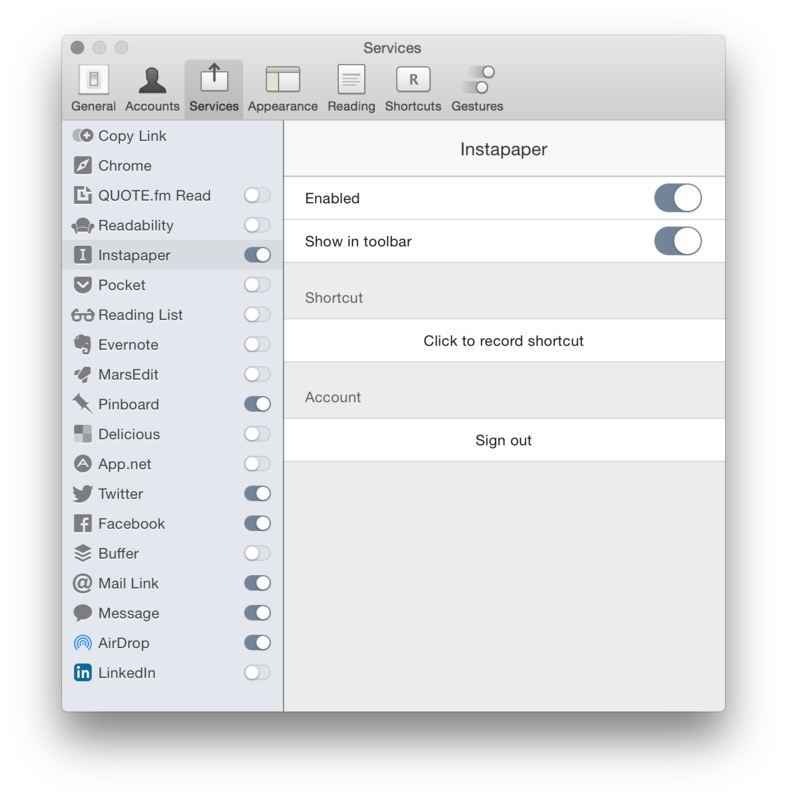 This means that if you use an RSS client on your iPad or iPhone as well as your Mac, they should stay in sync. Marking something as read on one device will mean it will show as read on others. Syncing with a web service also means that the speed at which an article will appear in Reeder isn’t up to the app itself, but the service in question. Speaking of speed, Reeder can be incredibly fast. In testing, it was able to sync with a Feedly account with 4,500 unread items in less than a minute. Once set up, this can be prove to be very powerful and efficient, but the setup process is a little clunky. A sharing method has to be enabled, but the app also allows a user to pin these to the toolbar or be assigned a keyboard shortcut. All in all, Reeder plays nice with more services than you can shake a stick at. RSS is all about text, so any RSS app worth its salt should provide a great reading experience. I normally wouldn’t be sharing so many screenshots of preferences, but I think it’s important to note just how many tools are at the user’s fingertips when it comes to fine-tuning Reeder. 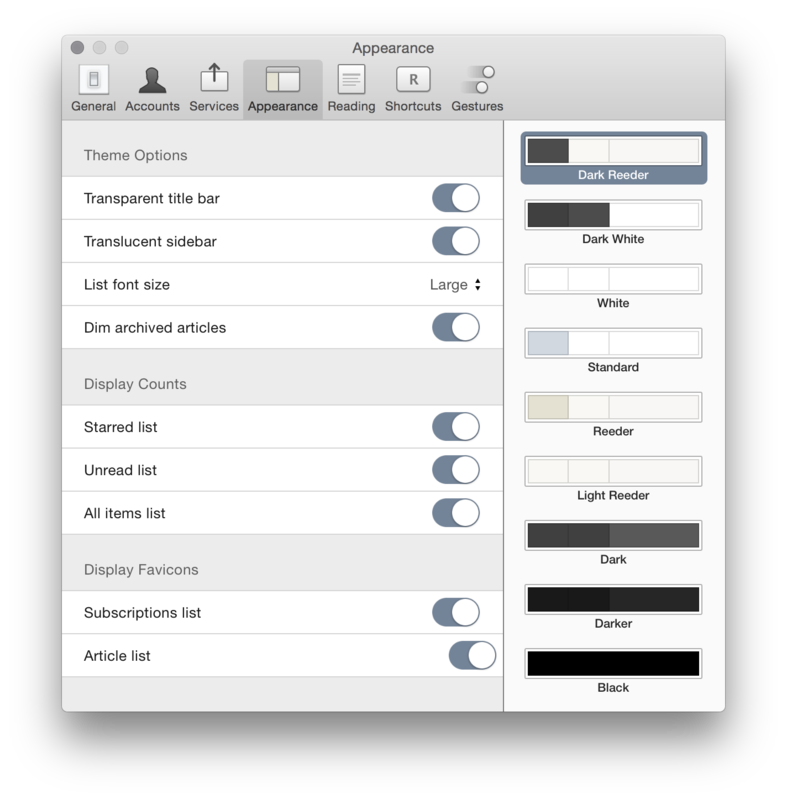 Appearance handles everything from a theming perspective. You can select a color theme — I like “Dark Reeder” quite a lot — and tweak the list font size, and a few other small details. Reading is a hodgepodge of more font settings, as well as options to attempt to load mobile versions of website in the in-app browser, settings for moving between articles, and more. 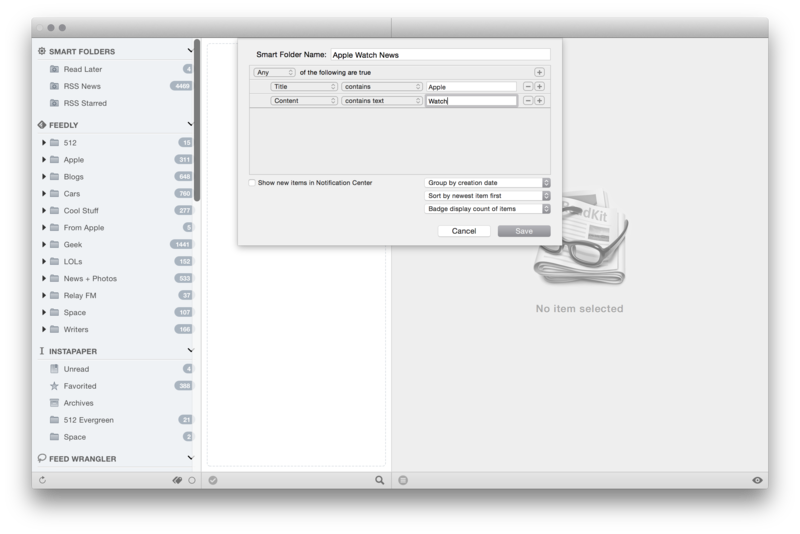 While all of these settings can be overwhelming, together, they grant the ability to fine-tune the Reeder experience. Once these gestures and keyboard shortcuts are ingrained, they make skimming and reading articles lightning-fast. In fact, the gestures in particular remind me that Reeder started out on iOS. While that may sound like a problem from an old-school Mac fan, the reality is that the best apps on the Mac should be flexible and powerful while easy to use. 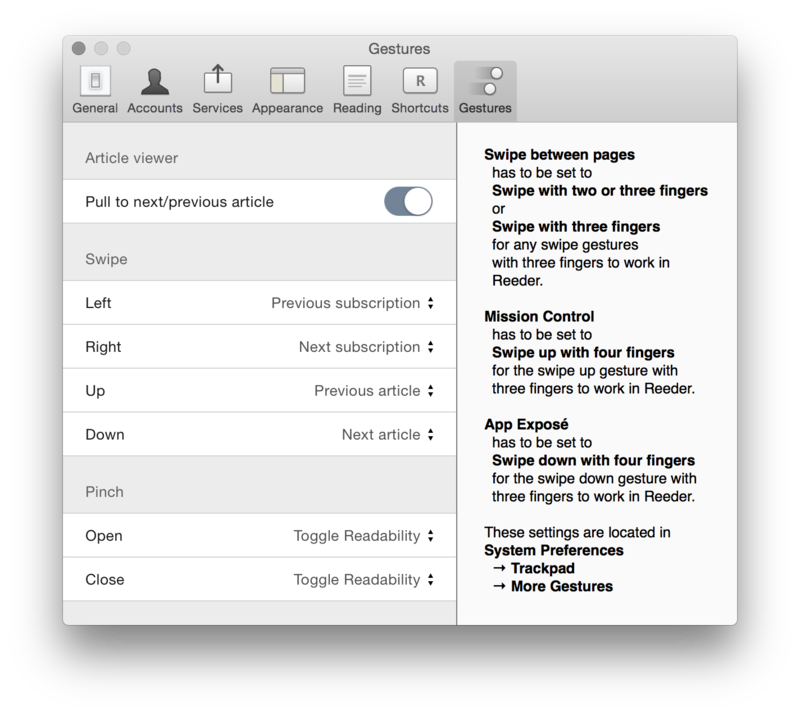 Things like gestures are a big part of that, but Reeder isn’t beholden to them. 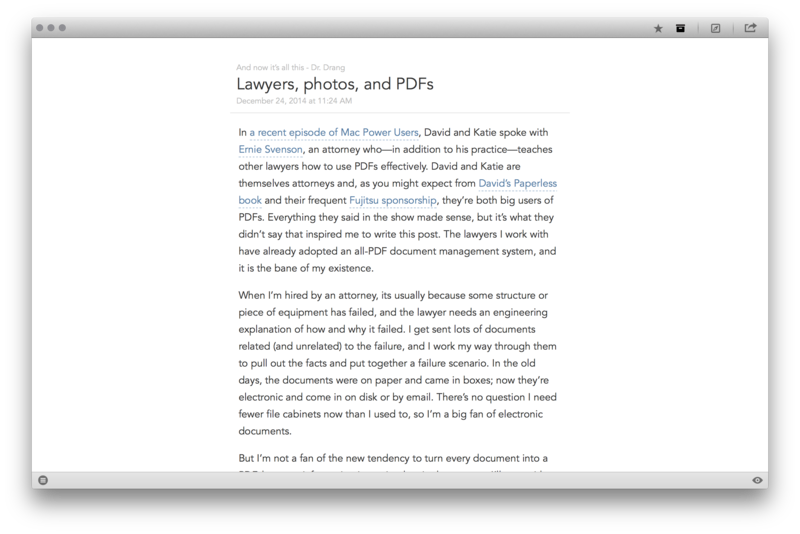 In short, Reeder is powerful and easy to use, and it’s my favorite way to read RSS items while at my desk. 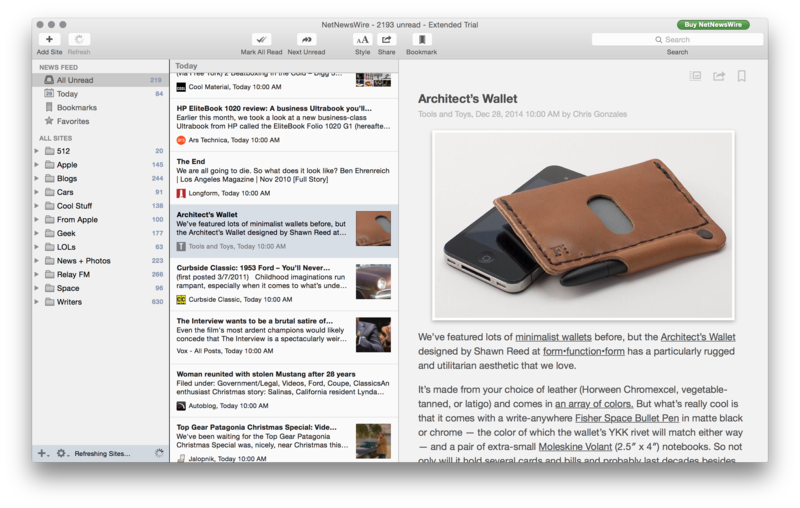 Reeder is $9.99 and can be purchased in the Mac App Store. 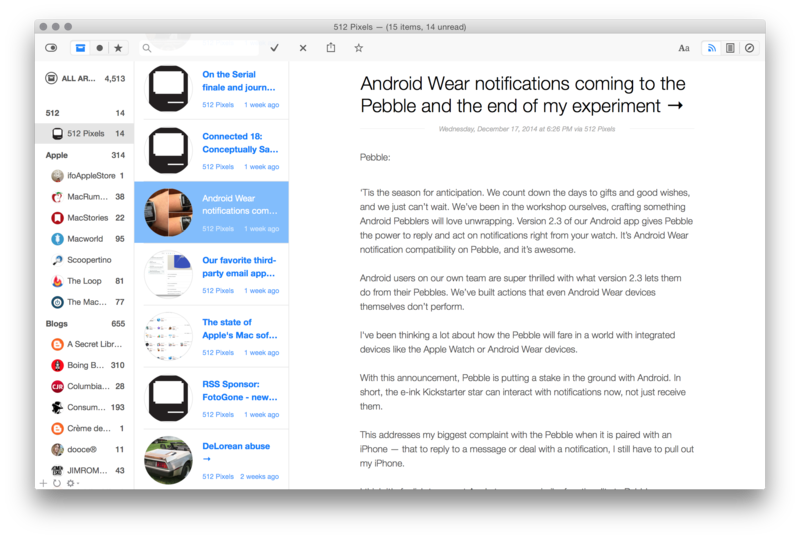 While Reeder has been around since 2011, it took the developer some time to re-group after Google shuttered Reader. 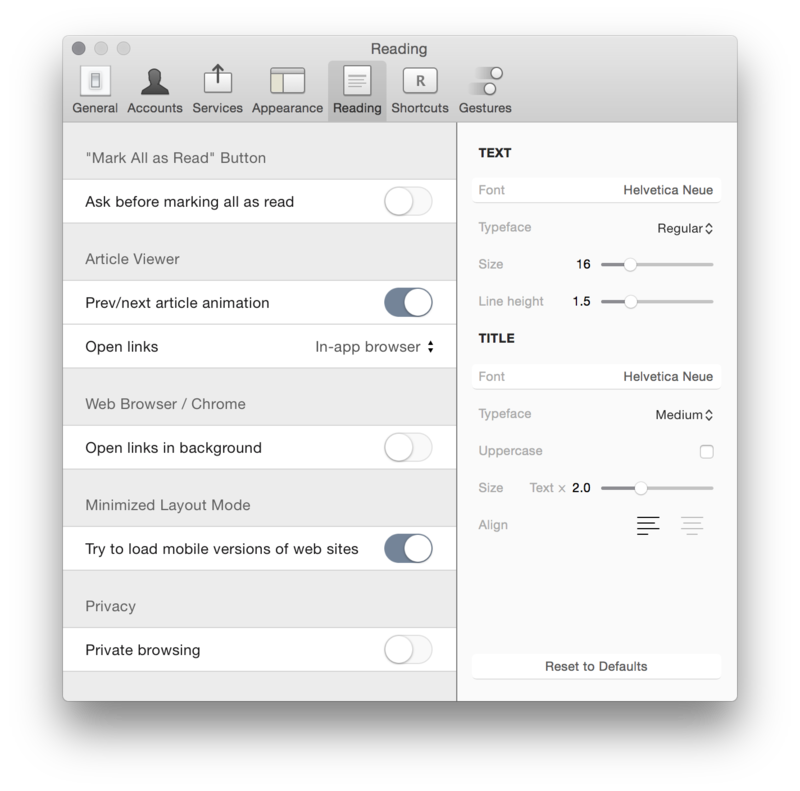 In the meantime, Readkit was used by many — myself included — to read RSS feeds on the Mac. Also $9.99, on the surface, ReadKit looks a lot like Reeder. However, it lacks a lot of the polish found in our favorite app. Right off the bat — as I was signing into my test Feedly account on the web — ReadKit interrupted, asking to be set as the default RSS application on my MacBook Pro. Once my account was set up, it was noticeably slower to fetch my test library of 4,500 unread items and took considerably more CPU to do so. In fact, despite anything I did, ReadKit remained listed in the “Apps Using Significant Energy” menu item on my MacBook Pro running macOS Yosemite almost all of the time. I leave my RSS app open all day; I want it to have as little impact on my notebook’s battery life as possible. While Smart Folders can be a great way to speed up reading, ReadKit itself isn’t as fluid as Reeder. There’s no gesture support to speak of, and it can be hard to tell where the focus is — more often that not, tapping the down key on my keyboard would scroll down the article itself, not the list of unread items as I had intended. 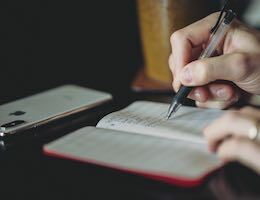 While Reeder can only send items to services like Pocket or Instapaper, ReadKit doubles as a client for these services as well, putting your Instapaper, Pocket, Readability or even Pinboard articles in the same application as incoming RSS content. This makes ReadKit a bit of a trojan horse — the Greek kind, not the scary computer virus kind. 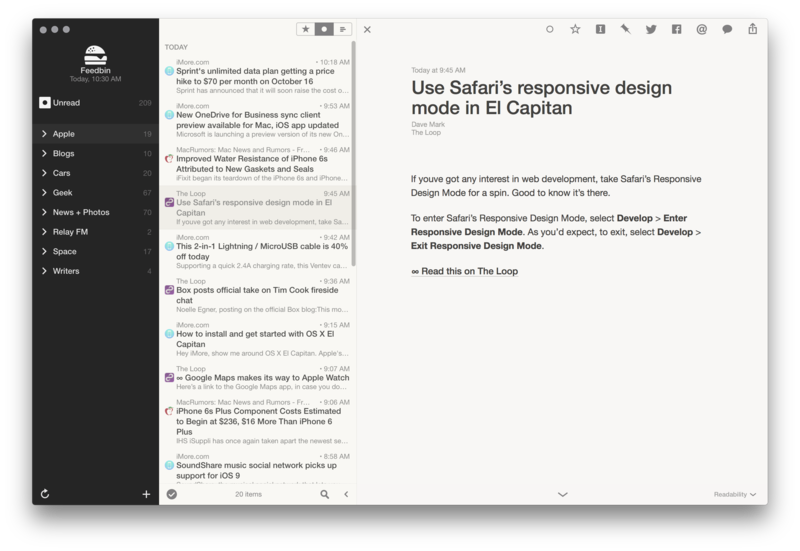 It looks like an RSS client, but in reality, can serve as a local Instapaper or Pinboard client just as easily. In testing, I had Feedly, Feedbin, Feed Wrangler, Instapaper, and Pocket all hooked up. This helps ReadKit feel more like a read-it-later service, but I honestly don’t care for it. Reading RSS items and articles I’ve saved for later are very different, and I don’t care for having them in the same environment. Coupled with the confusion of ReadKit’s interface — seriously, put tooltips on buttons — ReadKit feels crowded and stressful. As a further annoyance, signing into one of these service as a source for things to read doesn’t let the app send items to it without entering your account credentials again. If you’re looking for a jack-of-all-trades, ReadKit’s a good option, but Reeder is a nicer option. 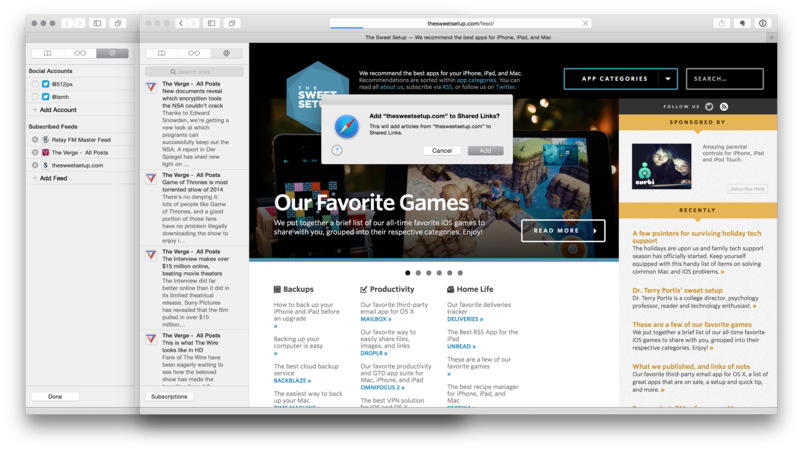 Safari — yes, macOS’s built-in browser — has some simple support for RSS. 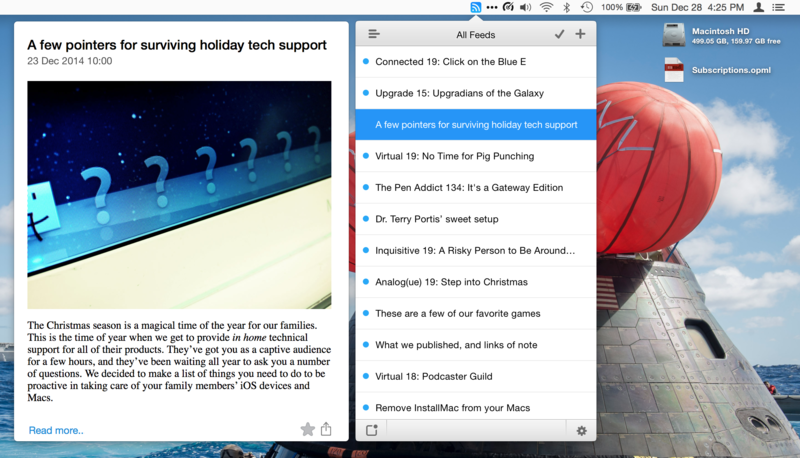 In short, Safari can add RSS feeds or social media accounts to its own sidebar. New items come in automatically and can be searched. All of this syncs over iCloud to other Macs and iOS devices, which worked quickly and seamlessly in testing. However, like many of the third-party RSS clients above, Safari’s Shared Links features works best if you have a very limited number of sources. It’s a great way to start with RSS, but most will outgrow it very quickly. 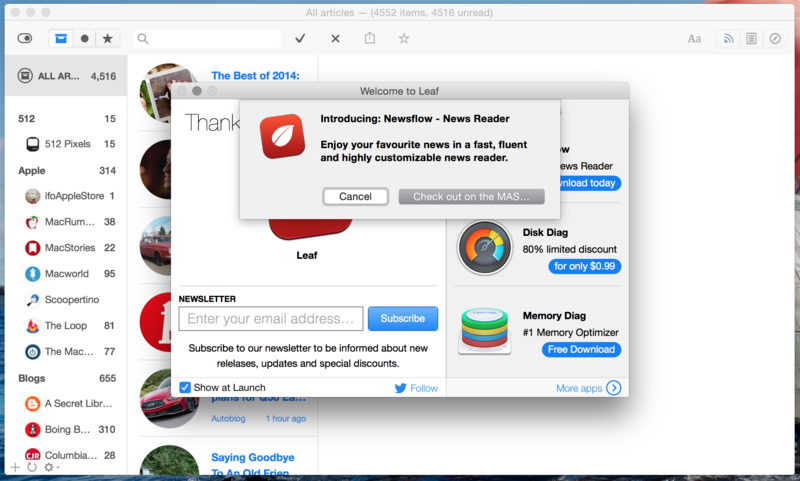 Leaf is a $7.99 app that is highly rated in the Mac App Store. Leaf’s design relies heavily on thumbnails from articles placed in circles. While, thankfully, a toggle can be set to turn them into squares, the reality is that a lot of articles don’t include images. To accommodate for this, the app will put the site’s icon in the item list, or an image from the source, if the article is a linked list-style post. 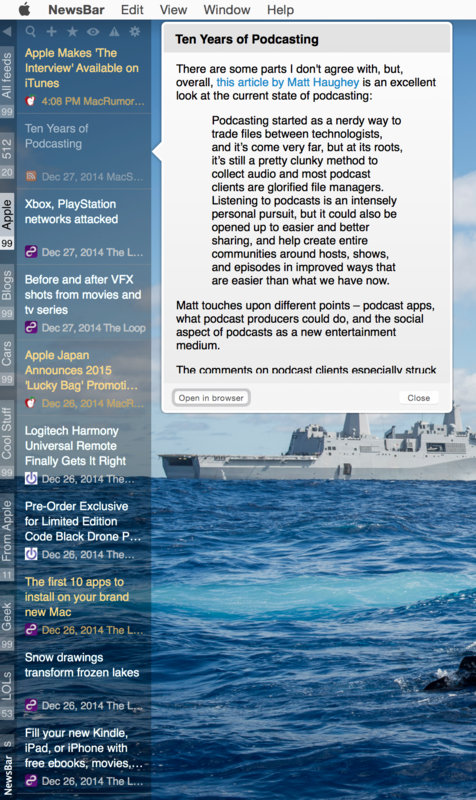 For example, above is the RSS feed for my site. That photo of the smartwatch isn’t from 512 Pixels; its from Pebble’s blog post I linked to. 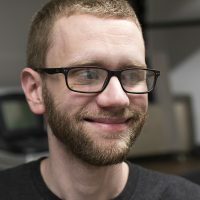 In short, Leaf makes it appear that Pebble’s image belongs to 512 Pixels. To be fair, Leaf isn’t alone in this behavior — Feedly does it on their website — but I find it a bit troubling as a website publisher. That image isn’t mine; I don’t want it to look like I’m using it without permission. While on the design front, Leaf offers several font and color theme options. The flat design coupled with a little transparency here and there may be trendy, but the app feels a little cluttered. Leaf comes with a good selection of sharing options, support for push notifications, and runs smoothly on my MacBook Pro. However, its limited support for RSS services and odd design choices should be considered when choosing an app. I have fond memories of running Vienna for several years on my old PowerBook G4. Vienna stands out in the crowd, as it’s free and open source, meaning anyone can help build it. Vienna can sync with BazQux, FeedHQ, InoReader, The Old Reader or any other Open Reader server of your choice. Sadly, under testing on macOS Yosemite, Vienna was prone to freezing and even crashing. However, it was the fastest at syncing my test library of feeds. If you’re looking for something open source and free, Vienna is about your only choice, but I’m not keeping it on my Dock. The simply-named RSS Reader is a $1.99 app that lives in the Mac’s menubar. The menu bar icon turns blue when new items come in. Once they do, items are sorted by publish date in the main window. Clicking an item will open a preview of it in an adjoining window. While some may appreciate the simplicity, it’s limiting at best, in my opinion. If you have a lot of feeds, this lack of structure will break down quickly. I think of NewsBar more like a ticker than an RSS reader. You can set keywords to be highlighted (notice the yellow words in that screenshot) and hover your mouse over an item to see an article’s content, which are both clever, but NewsBar doesn’t make sense for someone who wants a stress-free reading experience. RSS Bot is a free app that shows advertising at start-up like Leaf, but lives in the menu bar like RSS Reader. RSS Bot crashed while importing my test .OPML file, and adding feeds one by one was slow, as it took the app nearly a minute to “retrieve and process” each feed. RSS Bot couldn’t resolve The Sweet Setup’s feed, but once I got a few other feeds added, I couldn’t get RSS Bot to see new unread items. I don’t know what’s going on here, but I do know RSS Reader Plus isn’t worth its price tag. It doesn’t sync with any third-party web services, isn’t optimized for Retina displays, and routinely took massive amounts of CPU power in normal usage. 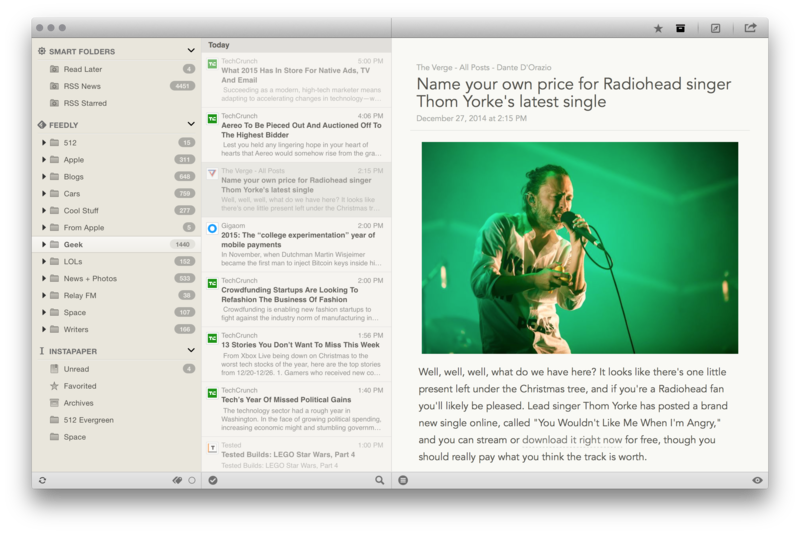 The popular RSS web service Feedly has a free Mac app that’s just a wrapper around their website. While it’s nice to be able to tab over to your RSS items, if you want to use Feedly on the web, you’re better served by doing so in a browser, which will be faster and less…weird. The app only syncs with its own RSS service; there’s no support for Feedly, Feed Wrangler or others. While this syncing has been fine in our testing, I found it to be stable while importing my test OPML file and pulling in several thousand unread items. For now, NetNewsWire isn’t a solid contender. In short, there is one great RSS app for macOS: Reeder 3. ReadKit’s not bad, but overreaches, and there’s a lot of junk on the Mac App Store fighting for attention. 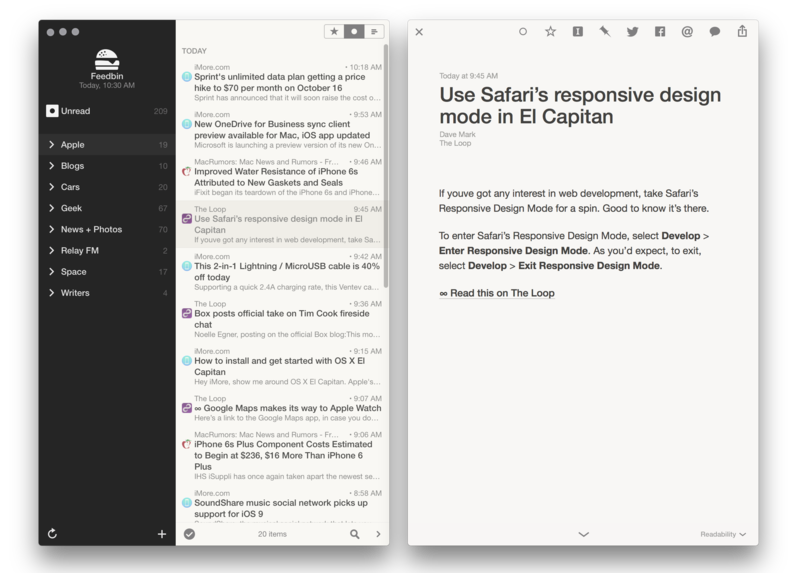 Take MobileRSS for example — it’s well-rated, but is designed to sync with Google Reader. The app hasn’t gotten an update since 2011. While that doesn’t factor into what the best RSS app is for the Mac, it does paint a pretty bleak picture of the Mac App Store. While the iOS App Store has its problems as well, because the Mac App Store is so much smaller, this sort of thing bubbles to the top much more easily. All that aside, RSS is alive and well, and it’s alive and well on the Mac if you ignore the noise in the Mac App Store and aim for the top.